Originally from Yokohama Japan, the owner of Kairakutei has brought his father’s famous ramen recipe to the states in hopes of rekindling that same popularity with ramen lovers of Orange County. And it may be working because year after year I’ve never heard anything bad about this place. It’s located in an odd triangle shopping center surrounded by Mcfadden, Walnut, and Newport Avenues. 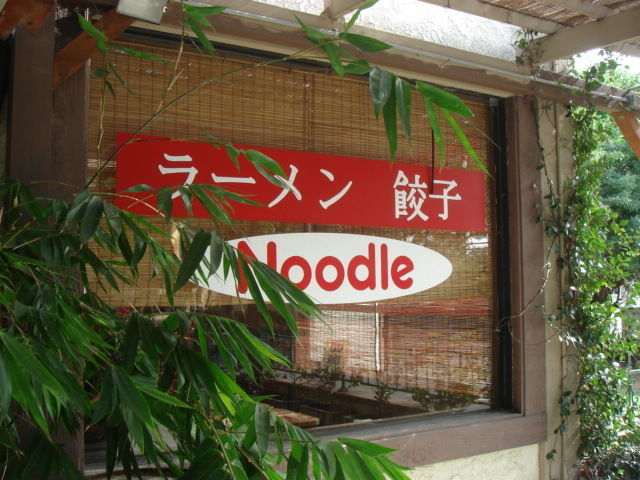 It may be hard to find so be on the look out for the ramen sign. Shoyu-ramen: After weeks of trying ramen bordering on blandness, this ramen is light years away. For some people, it may even be too strong. I, for one, found it exciting to meet a ramen with this much flavor. 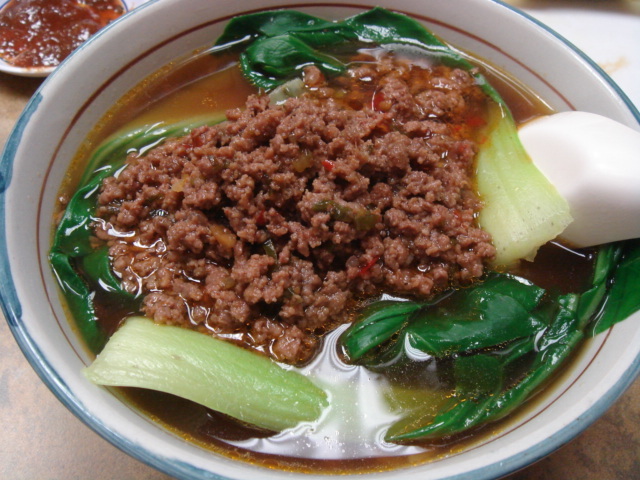 Another indication of the soup being strong was the darkness of the noodle absorbing the shoyu–marination at its best. If you tend not to like a strong soup make sure you tell the waitress when ordering. The chef will be more than happy to lighten it up! 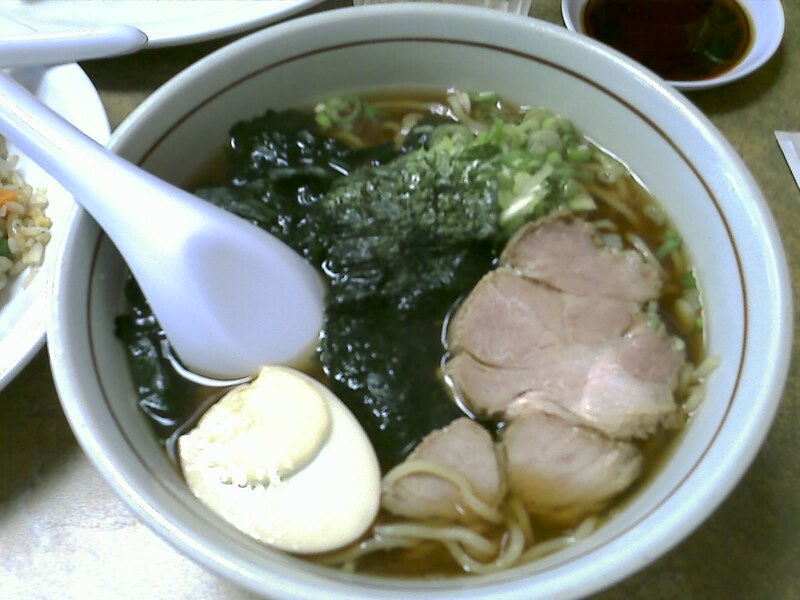 The noodle texture was perfect and the traditional toppings (egg, chashu, seaweed, and scallions) were quite the match. Even the uniqueness of being served in a bowl traditionally reserved for udon was amusing. My only complaint would be the lack of menma (bamboo shoots). How can a ramen be without menma?!! Well, I guess I’m willing to overlook it since the ramen was so good. Maybe I’ll just bring my own menma next time! 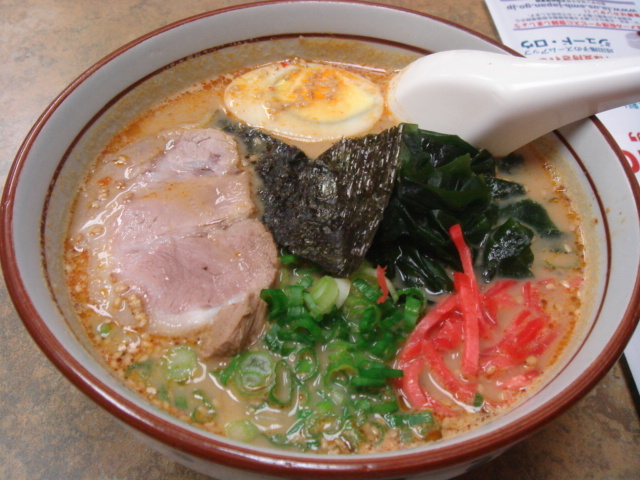 Tan Tan-ramen: Spicy and fulfilling! 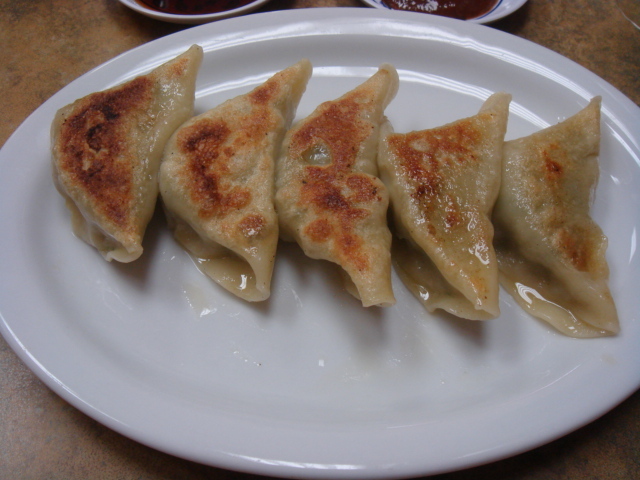 Gyoza: Claimed to be “home-made” (in which I don’t disagree), it’s still far from coming close to moms! But if you have room in your stomach, do not hesitate to order them. One could argue that they are made too big (bigger than the norm), but I think the size gives the big taste justice. After all we are in America! Chahan: When I first saw this chahan I got flashbacks of all the “okosama lunches” I’d eaten as a kid. 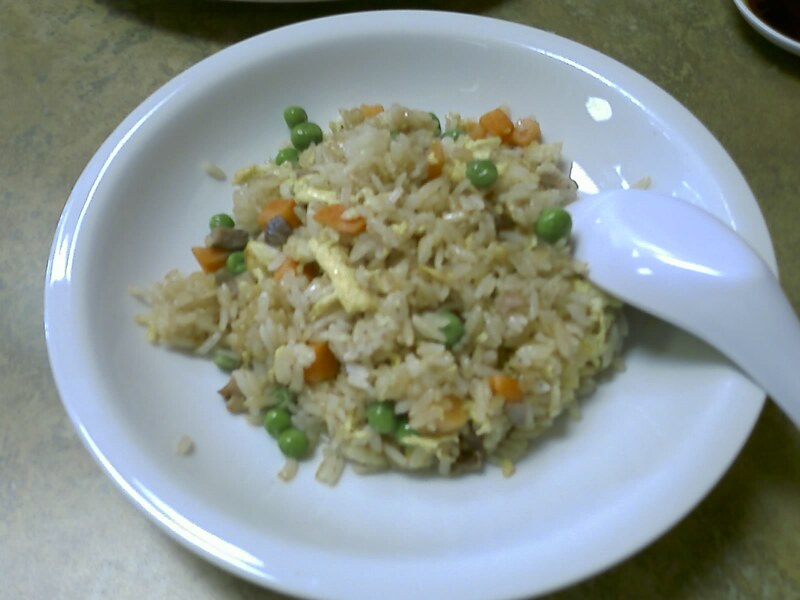 It looked so much like a childish plate of chahan that I hesitated to eat it. But after that first bite I couldn’t stop. The chahan may have been the best part of my visit to Kairakutei. It’s very rare that you find a chahan this good to accompany your ramen. And the good news is that it comes as part of a set. I highly recommend it! Hi J. Ngo, thanks for the update! Yeah, I've been back many times with friends and haven't had a problem either. That's really interesting. I bring in all my friends to check out this place (all ethnicities) and they have some of the best services out there in OC. The waitress was super courteous and when we went in right before closing time, they allowed us to finish and take our time. Really, no fuss or crap that usually is given when the workers want to go home. She was nice and served us to the very end even asking if we wanted some desert. This was only a month ago so I pretty recent. Hi Jere, I’m so sorry you had to go through that. That sounds terrible! And not to mention unacceptable! Well, if it’s any consolation, there are plenty of other ramen-ya’s that have excellent service including Foo-Foo Tei as the owner himself mentioned above. I also know the owner of Kairakutei through a friend and never thought he’d be like that, but I guess you never know nowadays. Well I hope you can still enjoy a nice bowl of ramen elsewhere. Thanks for visiting my blog! blkn3ko“`So sorry for what happened for you. I know it not going to be any excuse, but RAMEN still not considered popular as SUSHI in US.Majority of our customers are still Asian. So that’s where problem originated. I had bad experience as owner of business as well as customer.Onetime one guy (not our customer) came used our restroom, he flushed his underwear to the toilet. It cost me one entire dinner business to call plumber and fix. He might go through similar experience, made him over protected. I know the young owner; he is a nice guy, as I know. But it is no doubt that he made terrible mistake. Sorry again and hope you forgive him and stay in Ramen Fan.